Bees practice celestial navigation to communicate the position of the sun through dance. Millions ofyears ago a group of wasps ?decided to? become vegetarians and so today we havethe bee. Some of their cousins ?decided to? quit flying and so became the ants,but that is another story. Although only about 20% of bees are social, honeybees are very social indeed. It has been stated by several biologists that, ifit were not for the honey bee pollinating plants, humans would only last 3 or 4years as our food supply would disappear. The female honeybees are the workers of the hive. First, they learn to babysit, then theylearn the construction trade (specializing, of course, in hexagonal waxstructures), and eventually take on the daunting task of navigating in theoutside world. 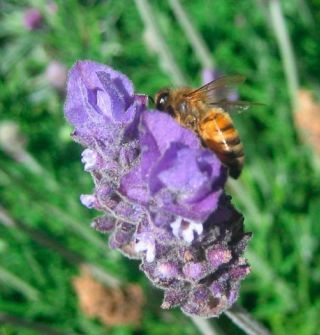 Honey bees have been known to travel to find honey over 10kilometers away from their hives ? the equivalent of a human flying from SanFrancisco to Denver to get some pollen. It takes about 6 bees life work, and thousandsof miles flown, to make one teaspoon of honey. Bees arethe only other species, to date, that have been shown to communicate withsymbolic language?that is, they can ?talk? about details of something that isnot present. (We note that psychologists dispute the use of the terms?symbolic? being applied to any non-human communication systems, but beescientists regularly apply this term to describe bee language.) And what dobees ?talk? about? Mostly astronomy? in particular about the Sun; where it is as compared to where the flowersare. And how do they ?talk?? Mostly they dance! We know ofthree languages that bees use; it has been postulated that they have severalmore. The easiest is the Round Dance. Basically when a bee finds a nectarsource nearby she comes back to the hive and dances around in a circle givingout samples; (for humans this works well at ice cream stores). The Round Dancetells the other bees to go out and sniff around for the source ? it is veryclose. Anotherdance is known as the DVAV Dance ? basically a kind of bee belly dance. Thisdialect is reserved for internal hive politics?who is to be the next queen? Isit a good day to swarm?? And so on. But themost studied language of the bees is the Waggle Dance. When a bee finds anectar source farther away, she comes into the hive and gets some of the otherladies to gather around. Although it is dark, they can feel how she dances andalso taste a bit of the quality of nectar she has brought back. She then startsthis special dance over the combs. If more than one bee is dancing, eventually,which source to go to first will be decided democratically; it is ?discussed?until the vote is unanimous.? In thewaggle dance ?up? is always the directionto the Sun. The bees have little muscles in their necks that can tell whichdirection is vertical in the dark. The angle from the Sun to the nectar sourceis then the angle at which the scout bee dances from the vertical, indicatingthe angle at which the others must navigate. But how faraway is the flower? As the scout bee (sometimes called the ?recruiter bee? )dances, the number of waggles she does in the correct angular direction beforeturning around to begin again is how far the honey source is in bee units.Different types of honeybees have slightly different units of measurement.Finally, the time she takes doing the dance indicates how much of a head windcan be expected. This tells the other bees how much fuel (honey) to tank up onto make their trip there and back. Many remarkableexperiments have been done with bees over the past hundred years?how they usepolarized light to see the Sun on a cloudy day, how they can understand thelandscape as a map and so don?t need to follow the same route back to the hivethat they took going out, how they know where the Sun is even after it sets andso can forage duringa full Moon, and many more. But I wasparticularly intrigued by a serendipitous experiment I read about recently thatoccurred when some university scientists were training bees to go farther andfarther away for nectar so they could determine the precision of theirnavigational directions to each other. They placed some nectar close to thehive and then moved it out 25% farther every day until, after a while, the nectarsource was quite far away. This required quite precise directions from thescout bees to the others in order to allow them to find a spot this far away?inother words, the angle of the waggle dance had to be smaller the farther thedistance. They weredoing this experiment, which had been going on for many days, when theprofessor got a call from his graduate student. The student?s car had brokendown so he had been unable to re-place the nectar source the extra 25% fartherthat morning. The professor said he would do it, then, that afternoon. When theprofessor arrived at the nectar source there were no bees present. But when hearrived at the place where the nectar should have been for that day (but hadnot been moved there yet), there were all the bees waiting for him! Not onlyhad the bees gotten the math correct (25% farther), but the implication is thatthey had demonstrated the imagination to be able to picture the future bypicturing the nectar?not where it was?but where it was going to be! Theprofessor wrote that he would never have done such an experiment on purposesince he never would have thought that the bees could have been so intelligent! Besidesbasically doing all the work to bring us fruits, vegetables, and otherpollination-requiring plants ? plus honey and beeswax - bees remind us not tounderestimate the expression of intelligence from any of our fellow (or, inthis case, our lady) species.? So to bee or not to bee is not the question. Wehave to bee, and we should be grateful to have such reliable, symbiotic friendsto share our planet with. So what does all this have to do with SETI (the Searchfor ExtraTerrestrial Intelligence)? Well the three main requirements forproducing extraterrestrial communications are a communication system, advancedtool use, and astronomy. Bees demonstrate non-human skills in all three. Andthe more we can learn from them (and other species) the more prepared we shouldbe for a truly alien signal if and when it is received from extraterrestrialsthat have not grown up on the same planet nor shared the same star with us formillions of years. ?